The American College of Trust and Estate Counsel, ACTEC, is an association of highly respected lawyers and law professors skilled and experienced in the preparation of wills and trusts; estate planning; and probate procedure and administration of trusts and estates of decedents, minors and incapacitated individuals. We have tapped some of our most honored ACTEC Fellows to help explain to families some the basics of wills, estate planning, and guardianship. 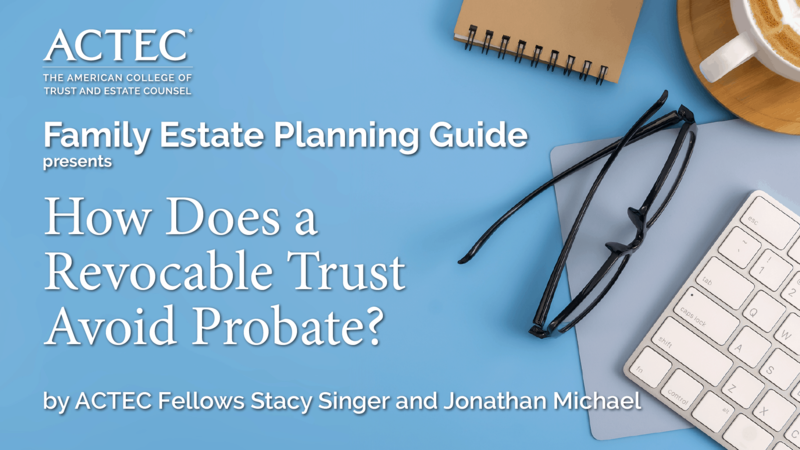 Understand how a revocable trust helps families avoid probate from experts in the field, ACTEC Fellows Stacy Singer and Jonathan Michael. ACTEC Fellows offer professional information regarding the joint tenancy including the advantages and disadvantages or holding assets in joint tenancy. ACTEC Fellows discuss “What is Probate? in this informative short video for individuals and families. Professor Mary Radford explains in everyday terms what you need to know about a Revocable Trust and if you need one through this informative video. Understanding your Power of Attorney (POA) is critical in estate planning. Bernie Krooks, a nationally-recognized expert shares his expertise in this video.